I was going to suggest Altras and then I read further ;-) These shoes have been a wonder for my neuroma, which isn't all that bad. 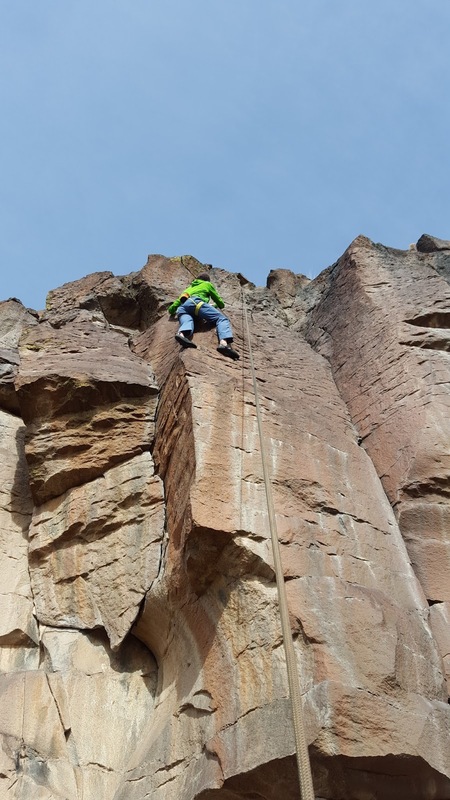 Good luck with the healing and Hardrock training! Thanks Steve. NM misses the Peros, too! 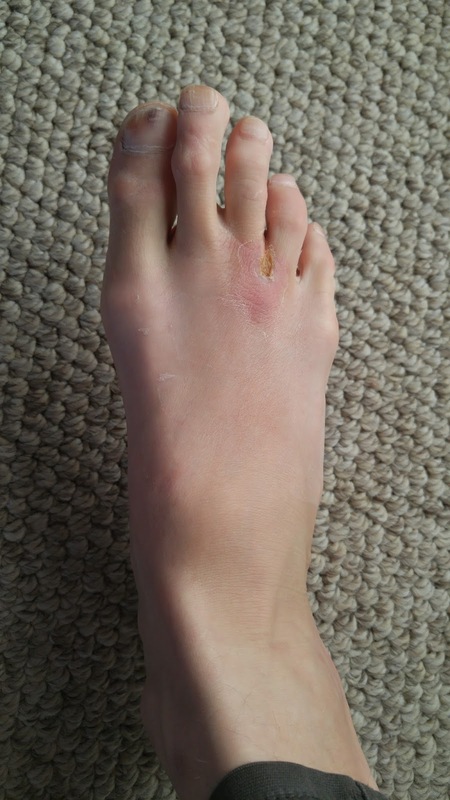 I'm really looking forward to healing up and training without the discomfort of this neuroma. I started running in Altras a few months ago and I'm looking forward to many more miles in them. The zero drop hasn't bugged me as I expected it might. Good to hear and I LOVE the Altras! Actually my favorites are the Superiors. I'm running the Cruel Jewel in May and plan on wearing those. That's a great detailed account--really glad that it seemed to go so smoothly and that you're getting back so quickly. Maybe even snow sports now? Something weird's going around town, though, what with all the foot injuries/repairs. I blame the plutonium and the government. Jason, Glad to hear you are on the mend. Foot surgery is typically slow to recover from, but you are doing amazing. Thanks +Mike Cappielo and Josh. I appreciate your comments. 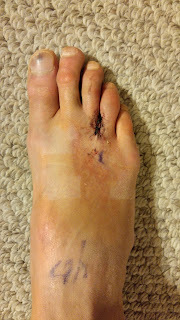 As far as surgery goes, this one seems quite minor and I'm glad to be healing so quickly as there's snow to be slid! What's the latest? The infection sounds awful--hope you are doing better. 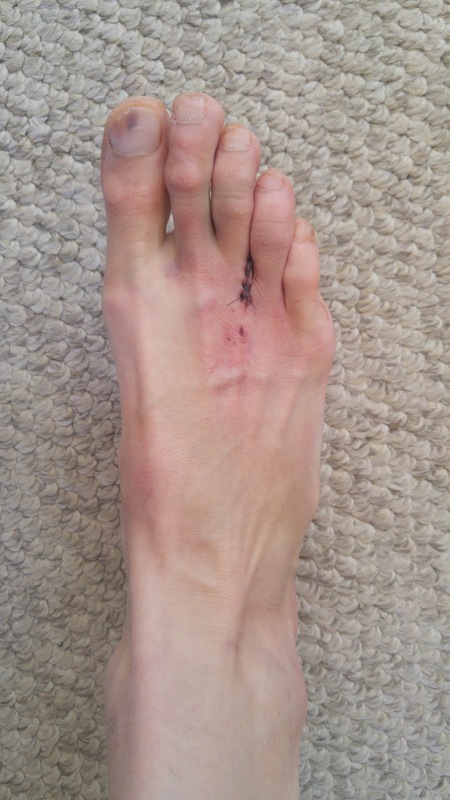 I have had increasing neuroma trouble for 10 years, which has seriously limited my distance running the past 2-3 years. 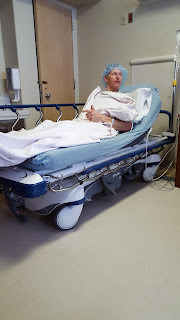 I had surgery scheduled about 18 months ago and chickened out but am now planning on surgery in April. Very interested to see how you have fared since your last update since I've had a hard time finding reports from distance/ultra runners on how it's worked out for them. Thanks for the comment coldsoil! I'm glad someone is reading this and hopefully my experience will help you make a decision and know what to expect if you end up doing the surgery. 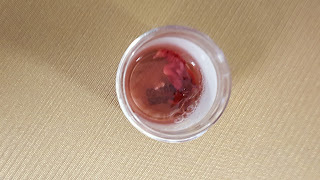 I just updated this post with a few more photos and information since February 24th. In short, at about eight weeks post-op I really noticed a healing change and things got better fast. I'm pretty sure I picked up the staph infection in a public shower at week four and that infection set my healing back about three weeks. I've run the past three days in a row and it's been pain free. The runs haven't been long enough for me to determine if the neuroma pain is gone for good but I'm optimistic now. I'll update this again in a few weeks with a report once I've been able to run longer. Feel free to send me a personal message if you'd like. Thank you for sharing your story with us. You have really been through a lot and come out on top which is commendable. 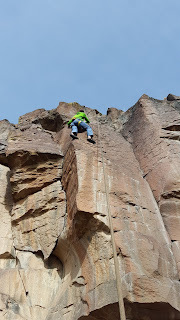 My brother suffers from neuroma as well and so i forwarded this link to him to read and get inspired. He has not made the leap to get the surgery done but I am sure he will. Thanks for your reply. Hope recovery is still going well. I'm on day 1 post op, no suction drain and definitely relying on the pain meds a bit but nothing too awful. Interesting how different surgeons have different requirements. 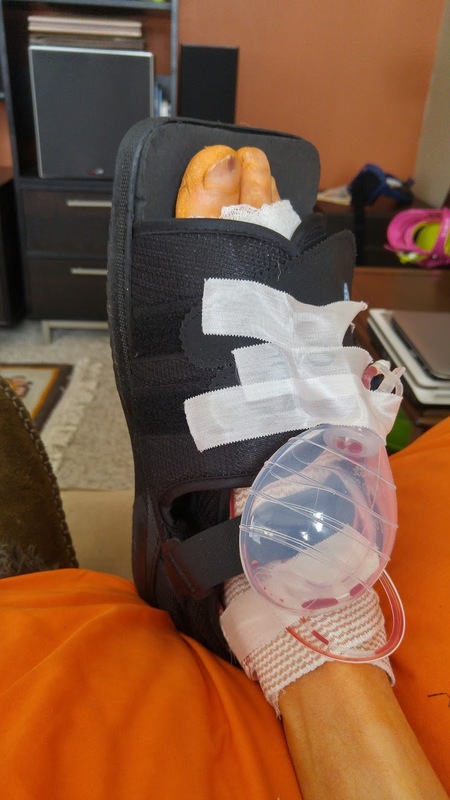 My doc is taking the conservative route, and I have a sterile dressing that I am not to remove for 2 weeks, and will be in a boot that whole time. I have a big rail race over labor day that I am hoping to be healed up in time to train for, so I am going to follow his instructions to a T. It's going to be crazy-making, though! I hope your recovery goes great, coldsoil. You're doing it right by heeding the doctor's orders completely. I have no doubt you'll be in great shape for Labor Day. I'm back in the swing of running now and recently did a number of runs on limestone trails without any discomfort. Those types of trails would typically have caused me foot pain but not anymore. Hooray! 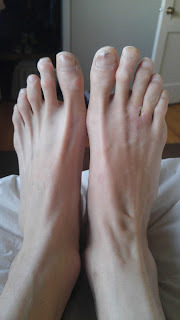 I have Morton's Neuroma, and something that has helped me a lot over the last several years ( I have not had surgery for it ) is simply NOT WEARING SOCKS and wearing shoes with a nice, wide toe box. That combination and avoiding many of the poorly designed shoes out there has really helped. I wanted to post this for those of you who have not tried not wearing socks with your shoes because of how much it has helped me, and it's such a simple thing. I can even run this way, in good running shoes with a wide enough toe box... but when I put socks back on, even with the good shoes, it usually acts up again. Please give it a try and see if it helps you while you might be trying to decide on what to do to further treat it. Hey Jason...Thanks for the detailed accounting of your travails with the foot neuroma. I have been battling with one for 4 years and have tried numerous approaches ranging from most conservative to actual surgery 7 days ago. Orthotics...incremental help. Cortisone injections...only worked for a few weeks at at time. Nerve sclerosis with alcohol injections...no help whatsoever. Finally 7 days out from a pretty good surgery and in the funky post op black shoe that is pretty much the foots equivalent of a vasectomy!! Anyway - I'm amazed at how soon you began pushing things and gonna go out on a limb and say you may have been up and running sooner if you had laid off and not pushed things...you only get one pair of feet and not much happens activity wise without them. Nonetheless - glad you made it...you are definitively the "driven" type bro! Based on your feedback and some of the comments, I ordered a pair of Altras and am excited to give them a try! 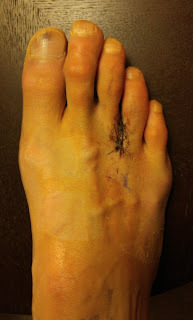 I had surgery two years ago read lots of blogs good and bad ones...had the surgery and my foot is fine now glad I had it done,,, don't know how I got it never wore heels....it's two years ago and the healing process is long about a year before it is perfect!!!! 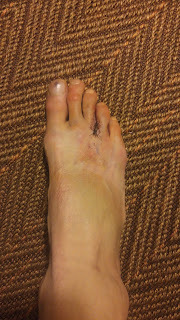 !my doctor was a good podiatrists!!! 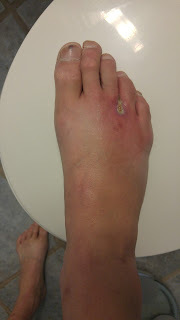 My husband has been diagnosed with Morton's Neuroma. He has been in excruciating pain as he stands on his feet 12 hours a day. We have started using a Ten's unit each night and it has made a tremendous difference! Some days he has no pain at all!! A welcomed change that has alleviated so many problems and no surgery!! Hi, I just had surgery and pray I can plan a ultra for next year. Wow, you jumped right in shortly after your surgery ehh? My Ortho Surgeon plan has me off of it for 2 weeks, elevated and iced. Ease into walking but plan on crutches and no impact (jumping, running, leg press) for 2 months. 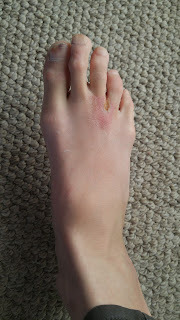 The concern is developing a Neuroma stump. I guess recent studies show that if not fully healed, impact of the surgical area can cause injury and the stump. 2-3 months off I hope increases the odds of complete long term positive results. Curious tho, your Ortho was fine with such an early return to activity? Hi jwood. Two and a half years later and I'm still completely good to go. I haven't felt, nor thought of, the neuroma so I consider that a huge success. 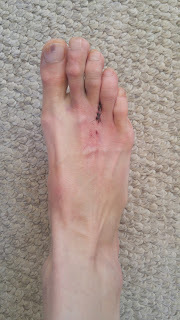 The podiatrist that did my surgery was pretty nonchalant about my seemingly early return to activity. From what he said, the fact that he was removing the neuroma, by definition created a new neuroma because it's a cutting of the nerve.